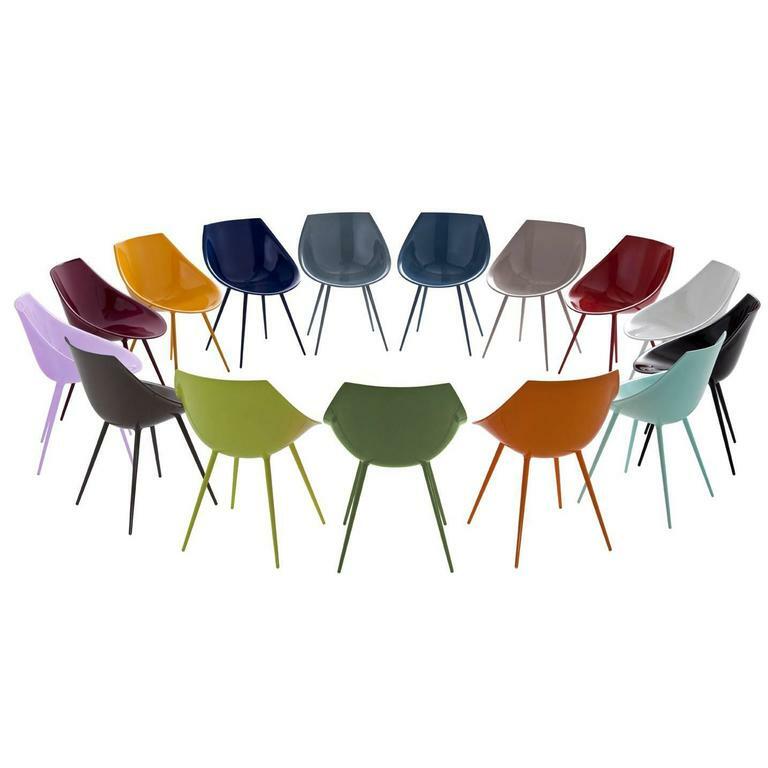 "Lago'" is a chair, designed by Philippe Starck and manufactured by Driade, made of a stiff polyurethane shell, supported by thin aluminum legs, and is available in a vast sampler of lacquered colors: white, black, special red, ultramarine blue, orange, green, acid green, light blue, blue, lilac, Burgundy, graysh beige, dark beige, saffron or dark blue. Indoor use only. Black and white versions only are available in quick ship (1-2 weeks). DIMENSIONS: D. 22.4", W. 23.6", H. 31.7", Seat H. 17.7" Characterized by an embracing shell and stiletto like legs, Lagò chair shows a strong image thanks to intense and bright lacquered colors which deliberately make its entire surface smooth. 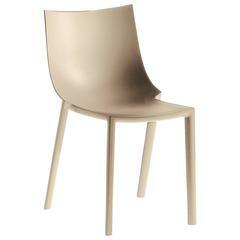 The chair can be also preciously covered by using leather upholstery. PHILIPPE STARCK is an internationally acclaimed French creator, designer and architect. His profound comprehension of contemporary mutations, his determination to change the world, his anticipatory concern for environmental implications, his love of ideas, his desire to defend the intelligence of usefulness and the usefulness of intelligence have accompanied one iconic creation after the other. From everyday products such as furniture and lemon squeezers to revolutionary mega-yachts, individual windmills, electric bikes or hotels and restaurants that aspire to be wondrous, stimulating and intensely vibrant places. This untiring and rebellious citizen of the world, who considers sharing his ethical and subversive vision of a fairer planet as a duty, creates unconventional places and objects whose purpose is to be “good” before being beautiful. Philippe Starck and his wife, Jasmine, mostly live on an airplane or in “middles of nowhere”. Available in a vast sampler of lacquered colors: white, black, special red, ultramarine blue, orange, green, acid green, light blue, blue, lilac, Burgundy, graysh beige, dark beige, saffron or dark blue. Black and white versions only are available in quick ship (1-2 weeks).\nPlease inquire for additional information. Philippe Starck "Costes" side or armchairs. Great design in these three legs chairs. 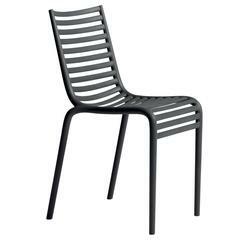 Philippe Starck for Driade. 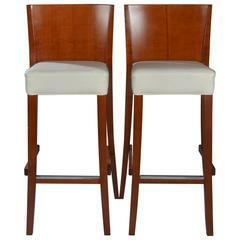 Four bar stools from the series 'Neoz' with lacquered wooden frames and seats covered with white leather. Measure: SH. 75 cm Up to four available. 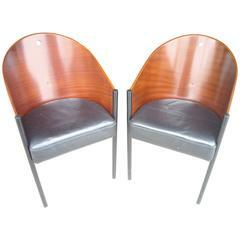 Two of three-legged chairs designed in 1982 for the Cafe Costes in Paris, one of the most iconic designs of the 1980s. Black metal frame, plywood with mahogany and black leather seats.